Andy Ockershausen: This is Our Town. This is Andy Ockershausen. And as I have the great, great honor to talk to a gentleman that I’ve admired from afar for many, many years. Chief J. Thomas Manger of Montgomery County. And the first question, Chief, is what does the J stand for? Chief Manger: It stands for John. I’m actually named after my dad, and I’m very proud of that. Andy Ockershausen: You’re a junior? Chief Manger: Actually I’m the third. So, named after my father and grandfather, and I have even saddled my son with the same name. Andy Ockershausen: But you were born … You went to the University of Maryland, were you born in Maryland? Chief Manger: I was born in Baltimore. Andy Ockershausen: Oh, in the city? Chief Manger: Yes, I was. And grew up in Baltimore City until I was 14. And my dad got a job with the federal government, and then that landed us in Silver Spring. Andy Ockershausen: And then how did you … Well, I don’t wanna ask … I’ll get to that, but you eventually came back to Maryland, but you went across the river to Fairfax. Chief Manger: It was. I … When I graduated from the University of Maryland, I applied to every police department in the Baltimore and the Washington, DC region. And when … I was actually going through the process for a number of different police departments. And Fairfax County just happened to hire me first. They called me and offered me a job, and I said okay. I actually had never been to Fairfax before I went there to take the test. But made a 27 year detour to northern Virginia. Chief Manger: Well, I did okay. Andy Ockershausen: You were a cop then. Andy Ockershausen: On the beat. Chief Manger: I was. And spent a lot of time getting to know the folks in the community over in different areas in Fairfax. I worked almost every district station in the county. And then was able to come up through the ranks and in 1998 was appointed the police chief there. Andy Ockershausen: That’s incredible. What a career. And that’s in northern Virginia of course. And you then knew all the other jurisdictions and so forth, but what made you decide to go to Montgomery County? Andy Ockershausen: It’s your home! Chief Manger: It was. And is. And so, I thought, gee I can go to another job that I would enjoy and only have to move 20 minutes away from where I was living. So, it worked out very nicely. Andy Ockershausen: Well, the thing that I’m so pleased about is you finished your school while you were a policeman, correct? Andy Ockershausen: We call ’em Rent-a-Cop. Chief Manger: Yes. Well, that’s what I was. And I’m not sure how much I learned about being a professional police officer, but what I did learn, being a summer cop in Ocean City, was that I loved this job. I loved being a police officer. It was the right career for me. Andy Ockershausen: Well, that’s wonderful Tom. That you’re so happy in what you’re doing. But, I’ve used this before and I’ll say it to your face, if I wanted to hire a police chief, I would call Central Casting in Hollywood, and they’d send me Tom Manger. Andy Ockershausen: Don’t you agree to that, Janice? I mean, you are the epitome of a police chief! Andy Ockershausen: You dress the part. Chief Manger: Well, don’t we all look the same? We all … I would say, we all have dark hair and a mustache, but that would let out all the women that are in this job. But, my hair is no longer dark. So, I can’t use that stereotype either. Andy Ockershausen: Tom, your image has been made. And so you’re set for life, which is very important. So, you then moving across the river. One of the people I remember down on US 1, a lot of policemen would come through the place, Doran Garage or something like that. It had a motel down there, and they finally had to sell out because the urban sprawl got ’em on US 1, finally. You probably have noticed what’s happened. Chief Manger: I have. I remember when I started back in the mid-seventies, and what Route one looked like below Alexandria, very different then what it looks like toady. Chief Manger: Yeah, yeah. But I … Just some of the bars and I use that term loosely, that were thriving down there then, are long gone. Andy Ockershausen: And now, I’m just reading today there’s another area that a plan … planned housing taking over northern Virginia. Of course, you’ve seen that when you moved across the river. The changes that you’ve experienced in Montgomery County have been fantastic. Chief Manger: Up on Dixon Avenue, which doesn’t … That section of Dixon Avenue doesn’t even exist anymore, because the Discovery Building headquarters is right on top of it. And but I remember just … I was in Silver Spring all the time and it is so different and so developed and such a huge attraction today. And when I was in high school you could see that it was probably … I mean, I didn’t know at the time, but it was probably sorta on the decline a little bit. Andy Ockershausen: Were you in high school in Montgomery County? Chief Manger: I did. I went to Montgomery Blair High School. Andy Ockershausen: Oh, yeah. It used to be Blair and then they in later years when I grew it up, it was Blair. And then they added the Montgomery, because that was important. But you’ve seen so many, many, many changes. And I wanna talk to you about that, but we’re gonna take a break right here, Tom, and get a deep breath. But, you’re a fountain of information. Technology truths, brought to you by GEICO. Truth: You have 14 login passwords. And you can’t remember any of them. Doug one. Doug two? Doug is awesome. Doug is awesome one, two, three. Truth: It’s so easy to switch and save on car insurance at GEICO.com. Doug is super cool ampersand, underscore, exclamation point, exclamation point, 1985. Knew it! Announcer: You’re listening to Our Town, with Andy Ockershausen. Brought to you by Best Bark Communications. Andy Ockershausen: This is Andy Ockershausen, this is Our Town. And Tom, if I said Manger, I’m wrong, it’s Manger. And I apologize. Andy Ockershausen: But it happens all the time, as you say. Chief Manger: It does. I get it all the time. Andy Ockershausen: It’s not intentional. But looking at your career, once you were a policeman is incredible. The work you’ve done with the National Academy and the Leadership School, and you’ve been to Richmond and I mean, it furthers your education as a policeman. Chief Manger: I have … The nice thing is that I’ve had a lot of opportunities. One of the best training venues I’ve ever gone to, and it’s gonna sound sort of … I don’t know what it sounds like. But, I was able to go to the John F. Kennedy School at Harvard. And I’m telling you, that was an amazing experience. Andy Ockershausen: Amazing. A wonderful library, isn’t it? Chief Manger: Just- It is. And, but the instructors, I mean, we were instructed by Harvard professors. And I was just in awe of how they taught, how they could take something that I thought that I knew a little bit about, and would learn that boy, I don’t know anything about it. I mean, and I hope I left there a better cop, a better police chief, but I’ve had some great opportunities in terms of training. Andy Ockershausen: Well, I can relate to your Harvard. I had an experience of Harvard, in the summer of 1968 by going to school up there in the summer. And finding it … We were with professors as you point out, we could never have afforded them, but it was all under the umbrella of the Broadcaster’s Association. Just my experience of being at Harvard was incredible. I learned a lot, but just being in Cambridge and see it. Andy Ockershausen: Was a fabulous, fabulous time. Chief Manger: Yeah, it’s an amazing place. Andy Ockershausen: And that’s great for you, and you must have had a lot of fellow officers with you. And what happened at the University of Richmond? Chief Manger: That was a senior executive school. And the interesting thing was at all these places, is that you’re able to work with folks that aren’t just police chiefs. I mean, they have folks that are heading up all kinds of government services, and businesses, and that sort of thing. So, you’re with leaders from a lot of different fields. And I think that some of the lessons you can learn from speaking with those folks, is very valuable. Andy Ockershausen: Tom, you’re 1000% right. You get other people that do other things, but have the same desire and management and management, management. I read that if you are a good manager, you can manage anything. But, you gotta first learn it. And that’s what you got to do at Harvard. A Good Manager Is. . .
Chief Manger: People, and personnel issues and all of those kinds of things, I think a lot of the skills that people who are leaders or heads of organizations, if they’re doing their job correctly, they can bring those skills and accomplish a lot of things. Andy Ockershausen: All the great leaders feel that way. And most of ’em prove it. Well, Tom, tell me about your family is still here? Your wife … You mentioned you’re married. Do you all live in obviously in Montgomery County? Chief Manger: We do. We live in Montgomery County. And I’ve got two teenagers, two high schoolers. Chief Manger: So that keeps me busy. Proud of my children. I mean, they’re both good students. Andy Ockershausen: Bet they don’t go to Blair. Chief Manger: They don’t. But that’s only because we don’t live in Silver Spring. Chief Manger: So, they … But they’re both active in a lot of different things. And I really … I’m glad. They’re enjoying their high school experience, which I’m happy about. Andy Ockershausen: That’s the best time of your life. Andy Ockershausen: I think it’s better than college, and better than anything, high school. Andy Ockershausen: For some reason. Well your changing, making a lot of changes. So, Tom, you’ve seen all the changes in Silver Spring obviously, but it’s happened all over the county of course. Everything, now upper county, there’s people up there now. And I remember driving through the northern part of Montgomery County, and there were cows and barns. Now there are people. Chief Manger: We still have cows and barns, but there’s fewer of them. I mean, we have places like Clarksburg and Germantown that have just really exploded. Chief Manger: And they’re delightful places. They have so much to offer. And the challenge for the county is to make sure that we have the infrastructure, to make sure that we have all the things, that we can continue to make sure that everybody enjoys the kind of quality of life that we want ’em to. Andy Ockershausen: Well, that’s your expanding force, of course, because you’re policing a lot bigger area than originally when you came into Montgomery County. I mean, it’s all happened up there north now. I mean, people, people. White’s Ferry I think of places that you couldn’t go to, it was like an all-day sucker to go up there. But now it’s all right close, and it just happened suddenly. Chief Manger: Yeah. And that’s … There are certain things that have been around in Montgomery County, you mentioned White’s ferry, but there’re certain things that have been around in Montgomery County for a long time, and are still thriving. But, everything just seems to look different now, because there’s been so much development, and so many communities have sprung up. And I mean, that certainly speaks well for the county, but it’s different, that’s for sure. Andy Ockershausen: Well, and but different is not strange. I mean, different is a lot better, I can see it. I can recall going to Richard Montgomery High School for my high school, I went in Washington at Eastern High, to get there was like an all-day trip. We’re going to Rockville? God, we better take a lunch or something. I mean, we don’t know what’s happening out there. Now, it’s … People don’t even think about it. I don’t even think it exists anymore. Chief Manger: Well, it’s … It’ll take you a while to get up Rockville Pike, but you can do it in less than a day. Andy Ockershausen: That’s right. And, Veirs Mill Road, was almost a dirt road. That was a long time ago. Well, Tom, I wanna talk to you about the police work in Montgomery County, but we’re gonna take another break here now. Thank you. [Begin Commercials]Charles Mann: Hi, I’m Charles Mann. For athletes like me playing every down in a pro game, is like getting in a car accident. After years of playing football in Washington, my body is broken. I’ve had countless surgeries and joint replacements. I’ve been looking for nonsurgical treatments since I ended my career. I heard a radio ad for a seminar about alternative treatment, that’s called Regenerative Medicine, which stimulates your own body to heal and repair itself. No surgery, no more pain, that got my attention. I went to the seminar to learn firsthand all about it. Now you too can benefit, and receive this treatment. This is the same procedure that pro athletes use to quickly and effectively recover from injury. If you’re looking to eliminate your pain and arthritis, or if you thought surgery was your only option, take the first step like I did. Call 410-787-7250. Register for the next seminar and learn more about this breakthrough procedure. Seating is limited, register now by calling 410-787-7250 and start living life again. Announcer: You’re listening to Our Town, with Andy Ockershausen. 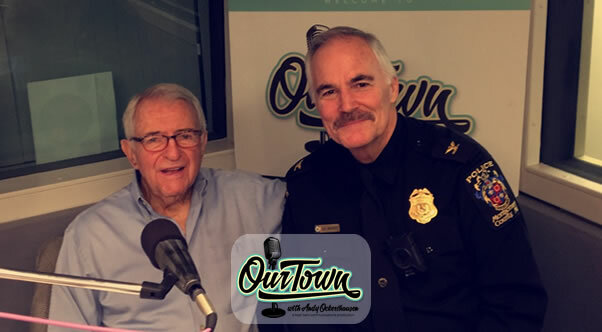 Andy Ockershausen: This is Andy Ockershausen, and I’m having a wonderful conversation with Tom Manger, Chief of Police of Montgomery County. But he has a great, great background, ’cause he was Chief of Police of Fairfax. When you think about it, the two most prominent counties in the greater Washington area. Tom has had experience with both of ’em. And he has won so many awards, but one of ’em, the Silver Medal of Valor, Fairfax County Human Rights Commission and the NAACP Community Service Leadership Award. You’re an award-winner, Tom. Chief Manger: Well, I think if you stick around long enough, people wanna be nice to you. But, no, it’s been very humbling, a lot of these … A lot of the awards. And it’s interesting that probably one of the highlights of my career was winning the Silver Medal of Valor in Fairfax. And these kinds of things, you ask any cop, and they’ll tell you, these kinds of things happen when you least expect it. Andy Ockershausen: Were you a uniformed officer at the time? Chief Manger: I was, yes. And so I was actually a supervisor at the time, and we got down there. We went … It was a cul-de-sac and it was pretty chaotic on the street there. And there were people out screaming and begging for an ambulance to help them. And the fire rescue was waiting for us to stabilize the situation, so I just looked at three other cops and I said, listen, I said I don’t know what this is, or … I said, but if this guy does have anthrax, that’s bad. And he had come out on the front lawn and was screaming and hollering. He was gonna just use this. And so, we … So, four of us just rushed the guy and got him into custody. And as we were putting him in handcuffs, he looked up at me, and he said, you know you’re gonna die now? And I just sort of shook my head. But, so we … He goes to jail, everybody is decontaminated. And the four of us, myself and the other cops, were being held in a parking lot at Fairfax hospital. And they said, well we can’t bring you into the hospital, because if you are contaminated, we can’t bring you into the hospital. So, we’ll send somebody out to check on you and to treat you. And so, look, the upshot of the story was that it turned out it was not anthrax, although this guy worked in a lab up, in I think it was Fort Meade. But anyway, they gave me an award for that, which that was an award from the Chamber of Commerce, which was very nice. Andy Ockershausen: Absolutely. Recognition, absolutely, Tom. I mean, that’s a scary thing, anthrax. And the whole idea of killing people. And obviously that guy was deranged or he wouldn’t have been out in the middle of the street. Chief Manger: Yeah. He had some issues, that’s for sure. Andy Ockershausen: Oh, I believe it. Janice Iacona Ockershausen: Chief, you have such a fine demeanor. You have a great kindness about you, and a great personality. And I imagine that’s one of the skills that is good for a negotiator. You’re probably a very good negotiator. Andy Ockershausen: I’m so glad to hear you say your mom, not your dad. Your mom’s a wonderful woman. Chief Manger: No, he- My dad gave me plenty of good things as well. Chief Manger: But my mother’s the one that really shaped my personality. Andy Ockershausen: It’s good to hear that. Tom, one of the things that’s impressed me many, many, many hours, when I said to you, when I talked to Tom about why are you still wearing your boards on your uniform is eagles. That’s the rank of a colonel. But everybody else I know around town in law enforcement, they’re wearing four stars. Andy Ockershausen: They have more medals than General Patton. Andy Ockershausen: And I can’t understand … But your answer, I’ll never forget, was we’re traditional, and I’m traditional, and these eagles are my tradition. Chief Manger: This way, if you look at the … I’m the … I think the 16th Police Chief in the history of Montgomery County police. Andy Ockershausen: I got back to Bernie Crooke. I know him well. Andy Ockershausen: And you got it. Well, even the Fire Chief now is wearing four stars. I mean, this goes way back. It just to me, it didn’t make sense, but next thing you’ll have five stars and be like Eisenhower. But Tom, that was my wife Janice Ockershausen, she’s really responsible for this program. And Janice has been working very closely with the problem with the opioids and the damage it’s done to our society. And I’d like Janice to ask you some questions. She knows more than I do. Janice Iacona Ockershausen. : Yeah, off-mic I was just wondering what the situation was for Montgomery County with the opiod crisis. I work with a client, DisposeRx, who actually it’s a product where you dump it into the vial with the leftover opioids, you shake it up and it becomes a goo, which you can throw away. Janice Iacona Ockershausen. : And it’s biodegradable. But my point is, this is … You’ve gotta see this on a daily basis. You’ve gotta see, you’ve gotta live it and breathe it and see it, the destruction that it’s causing. It must be horrible to be on the frontline like that and see this tragedy. Chief Manger: This is one of the biggest crises in our country today, opiod addiction. And if you look at the numbers of people who are dying from opiod overdose, it’s growing every year for the past several years. Same in Montgomery County. We had more deaths from opiod overdoses than we had from car crashes, from homicides, from even suicides. And so, it is a huge issue. Every day my cops are responding to overdoses. My cops have been trained with NARCAN. So, they’re able … And not only my cops, but the fire rescue has NARCAN as well. Now, NARCAN has been given to family members who know that they have someone who’s addicted in their family. So, it’s great that the NARCAN’s out there, ’cause it is saving lives. So, the next step is that we have to educate folks and we have to treat the addiction issues that we’re dealing with. This is not a hey, lock everybody up for possession of illegal drugs, that doesn’t help anything. Incarceration is not gonna help an addict, they need treatment. In this situation that I’m dealing with my client, I will tell you that I found out that 70% of all opiod addictions begin in the home medicine cabinet. And I know you all just had a take back day. So, it’s just an incredible opportunity though for someone to kinda grab it while it’s still … Before it becomes a problem, and sets the world on fire, as far as the addiction itself. Not having the temptation around for somebody to … They say realtors go into homes, they steal the opioids because they’re less expensive. And then of course that turns into heroin. So, I’m just saying that I appreciate everything you’re doing to stop the opiod crisis in our country, you’re on the frontline, and it’s an incredible thing that you all do on a daily basis to deal with this crisis. Chief Manger: Well, it is a crisis. And I think that just what you described in terms of some of the ways that people first get a hold of this, that’s all part of education. Chief Manger: And folks that have legally been prescribed this drug need to keep it secure. And not just keep it in the medicine cabinet, and when they’re done, they need to destroy it. I mean, so all the things you just talked about are part of the education process. Andy Ockershausen: Tom, one of the things that Janice has been involved in has opened my eyes up to it, and you said it about opioids, but I’m wanna ask you if you agree with me. And because he lives in the city of Washington, you know what’s happening with our gun violence. This year more deaths than all of last year already. It’s not gonna be solved by the police department. That’s my estimation. And I preach it all the time. This is a solution that’s gotta come from the citizens. A policeman cannot stop gun violence, usually it’s after the fact. But a homeowner can, a mother and father can, a brother and sister can take guns away from people. I’m convinced of that. Chief Manger: You know, it’s I think, up to elected officials, it’s up to community members, and the police do play a role in this as well. But, nobody can solve this by themselves. It’s gonna take a concerted effort. And when you see something like we saw in Pittsburgh last week, you just … And that becomes, oh, well there’s another one. And that becomes sorta normalized. That just shows you the situation we’re in. And we really have to do, I think, more as a community, more as a police department, more in terms of elected officials, legislatively, to do what needs to be done to reduce gun violence. Andy Ockershausen: Tom, what you say is so true. When is the next one? That’s what we’re waiting for, the next shooting, whenever it comes up. And I’m so upset with the city, because I know what’s happening in Washington. The death threat is incredible, and it’s all hand guns, it’s all shooting. And now I understand they got posses running around the city of Washington looking for a target. I hope they don’t come to Montgomery County. Andy Ockershausen: Or Prince George’s County. They felt it too out there. You haven’t had that much violence as PG has had it. Chief Manger: No, I mean I think that everybody in the DC region has seen an uptick. Andy Ockershausen: It’s Our Town. Chief Manger: I mean, we certainly have a fair number of nonfatal shootings. We’re blessed that for a number of reasons our homicide numbers are typically low. But, we’re still getting 40-50-60 shootings a year. And we’re just blessed that either people aren’t very good in terms of aiming, or that the medical service, I mean the fire rescue and the ambulances are so good and are saving lives as well. So, but we still have to address the root causes of violence, and that’s a bigger issue. Again, a bigger issue than just the police. Andy Ockershausen: Much, much bigger. Well, you must have left a big imprint. I see, I don’t know when Montgomery does this game, but Fairfax has that search and rescue team, every time there’s a national disaster, those guys pony up and get on an airplane and go somewhere. Chief Manger: Montgomery County has the same thing. I actually, during Hurricane Katrina, we sent folks down to New Orleans. And they asked because of the situation down there, they asked for a contingent of police officers to go to provide security for the work that was being done down there. And I went, flew down, and spent some time down there just making sure my cops were okay, and making sure that we were able to provide the help that folks needed. Andy Ockershausen: I’m sure the people in New Orleans loved that and loved to see ’em and loved everything. They show up at … I get more kick out of hearing about the Montgomery County Fire and Rescue, saving people in the Potomac River, that still don’t realize that Great Falls are dangerous. Chief Manger: You know, Potomac River is such a beautiful thing to look at. But I’m telling you, underneath the top of that water, it’s dangerous. Andy Ockershausen: And it happens every year, not just in the summer. Tom, you just epitomized to me a good cop. And you live it and breathe it. And Montgomery County is so fortunate to have you. It’s Fairfax’s loss incidentally, wait’ll I tell ’em that. Chief Manger: Well, thank you. I appreciate that. Andy Ockershausen: And thank you for being with us, Tom. It’s been just great. And I wanna thank Janice for her interviews and her good questions, but we are very deeply involved with this opiod problem. And wanna continue to do everything we can to bring it to the light. So, thank you Tom Manger, Chief of Police of Montgomery County. This is Our Town, this is Andy Ockershausen. Announcer: You’ve been listening to Our Town, Season 4, presented by GEICO. Our hometown favorite, with your host Andy Ockershausen. New Our Town episodes are released each Tuesday and Thursday. Drop us a line with your comments or suggestions. See us on Facebook, or visit our website at ourtowndc.com. Our special thanks to Ken Hunter, our technical director, and WMAL radio in Washington, DC. And thanks to GEICO. 15 minutes can save you 15% or more on car insurance.